Once you have decided to invest in an LMS, you need to make sure you are getting the most of your technology. LMS support is what you need to ensure a carefully planned and executed implementation that ensures your people get what they need when they need it. At SureSkills, we offer a range of services from consulting and strategy to a 24/7 Service Desk solution. We are there every step of the way before, during, and after implementation. Check out our webinar outlining why so many companies are investing in their cloud LMS infrastructure! Why do I need LMS Support? LMSs offer end to end talent management solutions using built-in intelligence that is highly flexible and customizable, empowering your people management teams to keep pace with an ever-changing environment. To make sure you realize these benefits, SureSkills offers a suite of services that are agile and scalable and equipped to handle rapid growth while improving performance, reliability, and business insights. Our service streamlines the operation and management of your LMS, enabling your leaders to concentrate on creating innovative ways of meeting the diverse needs of your organisation’s multi-generational workers and growing your business. All too often, organizations are failing to optimize their LMS platform because they don’t know what they need in terms of support, content, and training. Without the right governance culture, you could be missing out on the full business value of your technology investments. For this reason, we have established a comprehensive process that guarantees success at all phases of the LMS journey. We provide a comprehensive analysis of your support, content, and training requirements and business objectives to recommend customized learning and knowledge based solutions. Effective and proactive support can drive adoption while increasing user confidence and system usage after implementation. The SureSkills service desk enables you to add new features and modules as they launch to ensure you get immediate benefit from the latest system updates. End-user Support: Available 24/7 to manage and resolve learning management system (LMS) or learning and content management system (LCMS) related issues from learner audiences. LMS / LCMS Administrative Support: a dedicated administrative support team provides tiered support to ensure that your LMS or LCMS is functioning optimally. Content Management Support: access to our information and knowledge management consultants. Migration Services: we assist our clients to move content, user, and locational data between LMS or LCMS, ensuring that content and objects are consistent between systems. Technical Support: we provide support for e-content conversion, customisation and integration, tracking, reporting and analytics. The SureSkills service desk uses our proven method of LMS support capability: Support Excellence Framework (SEF). Governance through SEF provides clear overview of support process, ownership and governance, ensuring the best possible outcomes for our clients. Our SEF structure includes processes, workflows, and clear roles and responsibilities (RASIC), which ensures a sustainable, business-driven, learner-centric experience that delivers ROI and commercial value. 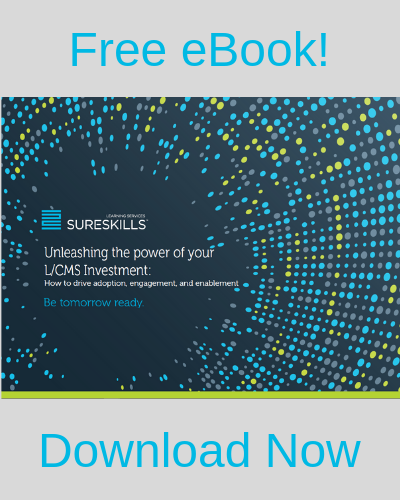 How can I measure the success of my LMS investment? You will (understandably!) want to see the impact of your investments on your business. Unfortunately, many training initiatives have not been designed with measurement in mind, so it has always been difficult to measure impact and ROI. We help you build meaningful measures of success from inception to ensure your LMS implementation is aligned with the needs of your organization. Powerful data management and analytical tools allow us to continuously assess the business impact of our programme and service offerings. With these tools, you can make informed business decisions based on realtime data, comprehensive reporting, and practical insights. We can help you to target and optimise the resources that are making the biggest impact on your business.